If you create display ads for your job, you’re already well aware of how hard it is to get prospects to click. Unlike search ads, display ads aren’t typically served up to an audience who is actively on the hunt for something specific, so there’s even more pressure to stand out. 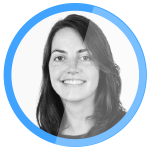 Think about it: when was the last time you clicked on a display ad? 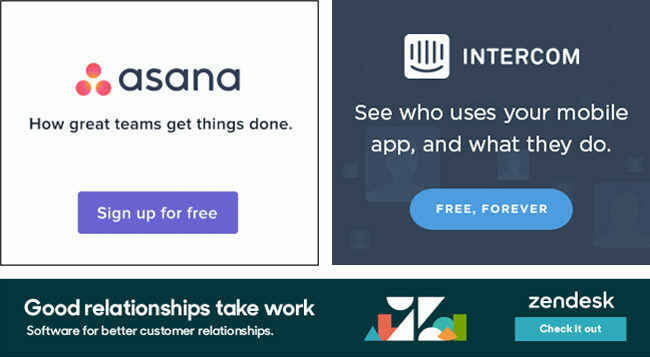 On our quest to find out what makes for click-worthy ads, we interviewed the marketers and designers at Indochino, Wistia, Webistry and Unbounce to see what inspires their display ad designs. Turns out that many of them draw inspiration from the very ads that entice them to click. The biggest design takeaway here is simplicity. All three ads are clear and to the point. The designs are clean and bright with minimal text. 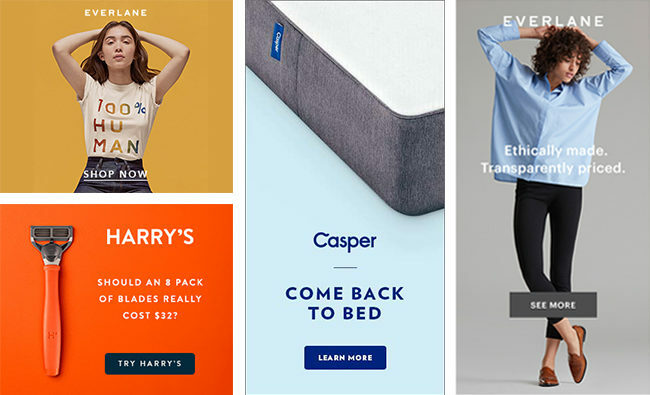 Casper, Harry’s and Everlane feature their product in the ad, but in an understated way that does not overwhelm the space. 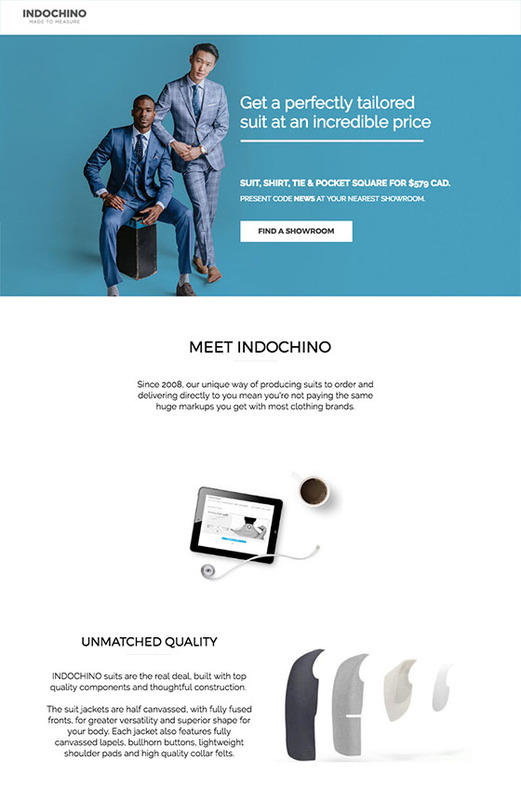 Indochino translates the same rule of simplicity from the Harry’s, Casper and Everlane ads into their own ad designs. Take their “Tailored Advantage” display ad on the left for example. 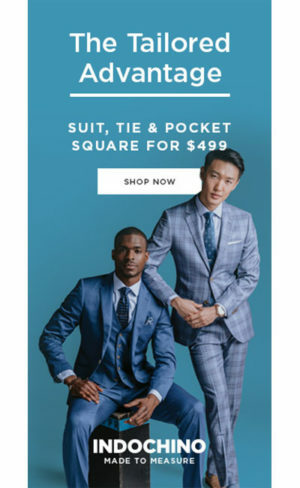 Although the ad canvas is limited, the design elements are minimal which means that Indochino can feature the product in the design without over-crowding the space. Consider where the ad will be seen. If the image does not have a full bleed background, then we often place products on a colored background. 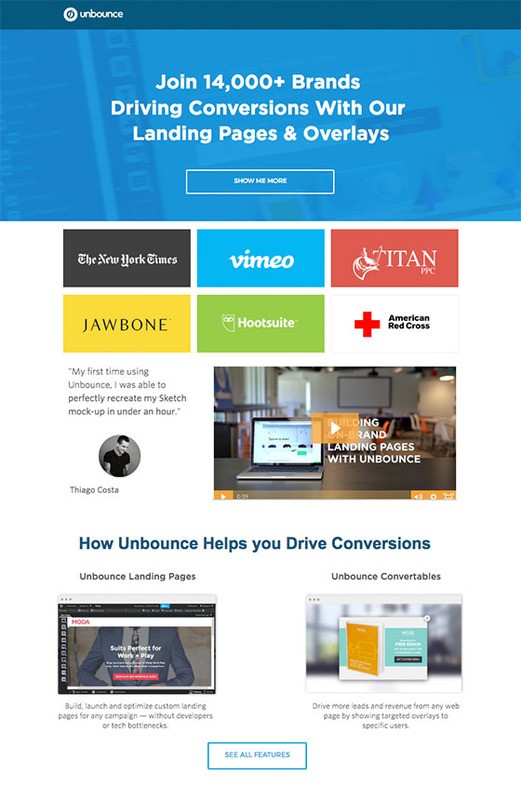 Unbounce customer Indochino sends traffic from their “Tailored Advantage” campaign to this landing page. Click to view full-length page. 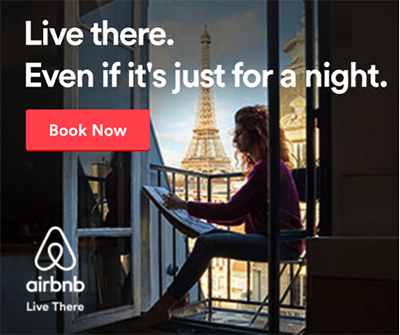 There are clear benefits to having a minimal, straightforward ad leading to a landing page with flawless design match: this page converts at 7.8%. 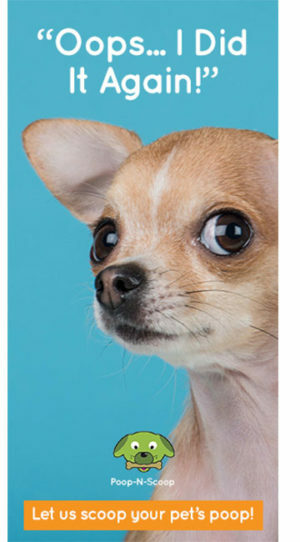 I love MailChimp’s ads. 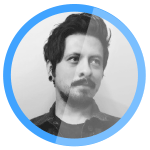 Their work is consistently unique, delightfully surprising, and – even when it appears to diverge stylistically – is always on-brand through personality or mission. Challenging the preciousness of style guidelines allows them to take more creative risks, and it pays off. 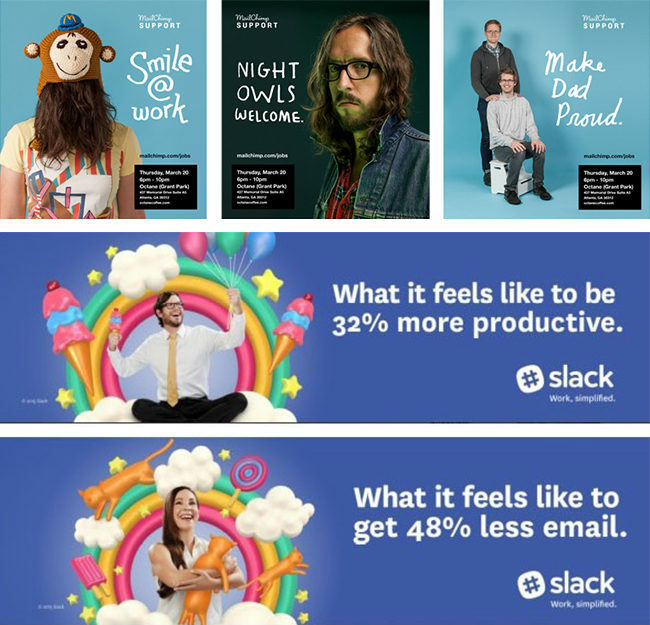 In other words, these companies do a good job of staying on brand but they’re not afraid to take quirky design and copy risks. 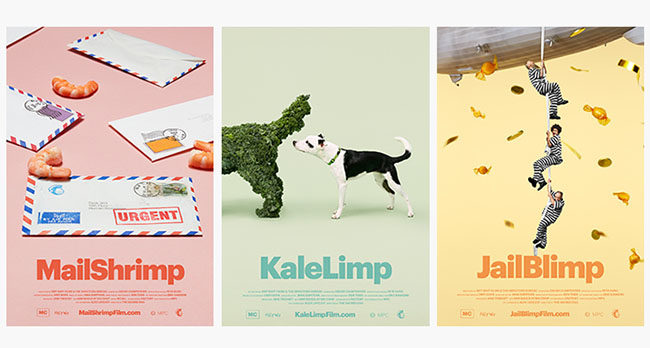 For example, the MailChimp ads use a clever play on words by incorporating copy that sounds like MailChimp in order to grab prospects’ attention: MailShrimp, KaleLimp and JailBlimp. 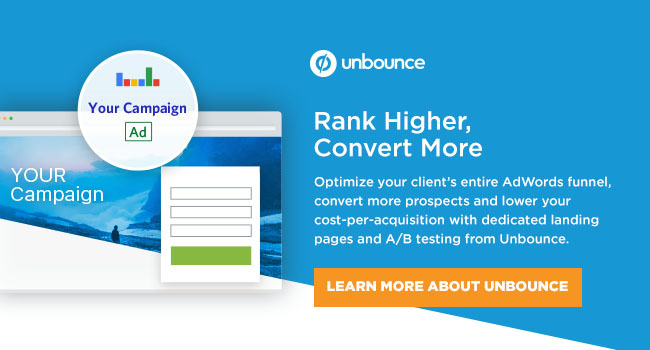 One thing that stands out about these examples is that they commit to one direction, spark interest by connecting with a feeling, and let their linked landing page do the rest. 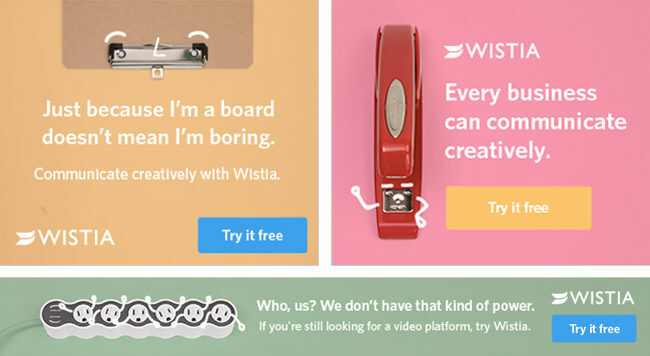 By pulling upon creative inspiration from brands like Slack and MailChimp, Wistia created a set of ads with a strongly branded yet playful theme. 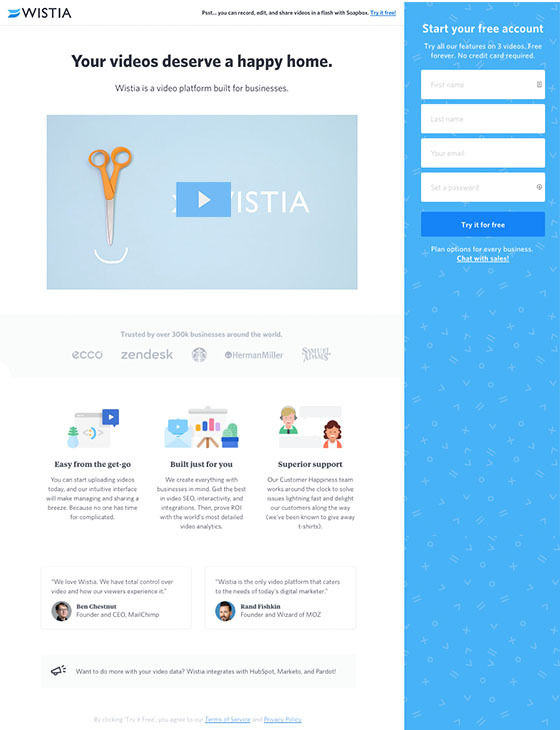 Unbounce customer Wistia sends campaign traffic to this dedicated landing page. Click to view full-length page. 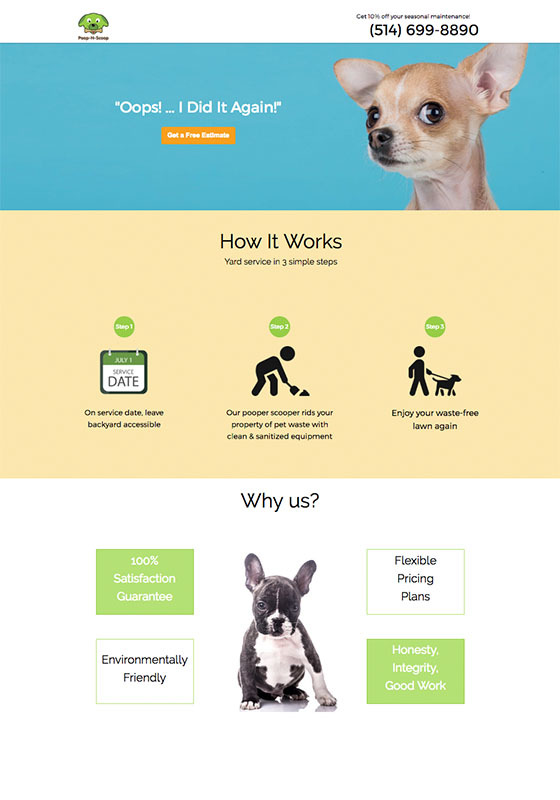 It’s an approach that has worked well for them; this landing page currently converts at a healthy 13%. 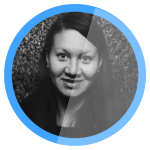 Montreal-based digital agency Webistry is a small team with big ideas. Stefano explained that the ads that really get his attention are those that tug on his heartstrings (or get him to laugh with a dash of humor). He explained to me that when you play on your audience’s emotions, they feel more connected to your brand and product. The closer the connection, the more likely prospects are to click. An image of a puppy can stir emotion in just about anyone. So when Webistry set out to help their client Poop-N-Scoop run an advertising campaign, they knew that an emotional approach was the way to go. 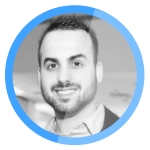 But Stefano and his team took things a step further by creating animated banner ads, using a very simple HTML5 banner tool: Google Web Designer. Animated HTML5 display ads (when done correctly) should provide an additional layer of engagement from your viewers. 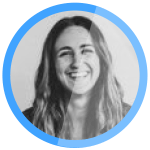 Overly animated ads could actually hurt your CTR (click-through-rate) so, like everything, test! Click to view full-length landing page. So how’d the campaign fare? For the 60 day period that this campaign was live, The Poop-N-Scoop ads had over 155,000 impressions with a click-through rate of 0.3% to the campaign’s landing page, which converted at 5.9%. The most important thing to have is a clear and legible typographic hierarchy. It doesn’t matter if you have amazing visuals — if your audience can’t read or understand your message, they won’t click on your ad. This means that key elements should appear prominently and be emphasized visually with bold copy. That’ll allow users to quickly scan the ad copy for key information. Display ad space is limited — too much text is confusing. A bewildered prospect won’t click. Inspired by the companies listed above, we included an understated company logo. Instead of relying heavily on imagery, we emphasized the ad copy that spoke to the services we offer and the action we wanted prospects to take (try a 30 day trial). The purpose of the landing page is to get prospects to check out more features or go to the pricing page to sign up. Since launching the campaign a little over two months ago, we continue to see conversions increase significantly over time. The ads have a click-through rate of about 0.3% while the click-through rate of the landing page is currently sitting at 22%. 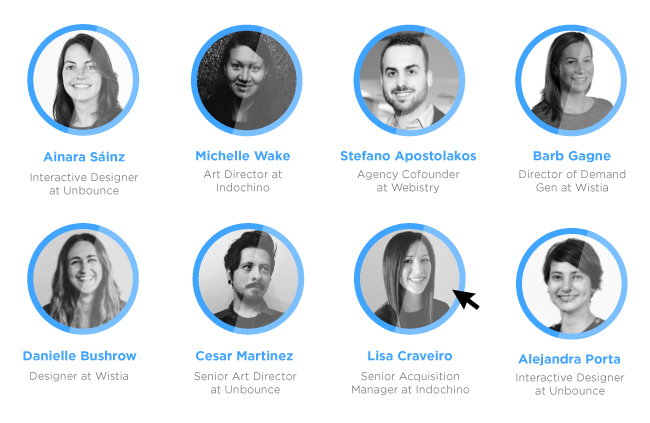 Now that you’ve learned how brands like Indochino, Wistia, Webistry and Unbounce have mastered the art of ad design, we hope that we’ve equipped you with the creative inspiration you need to take your display ads to the next level. And finally, one last thing. 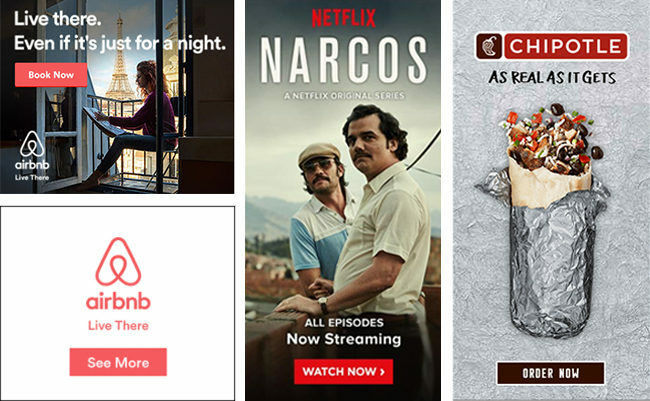 In exchange for our advice on how to steal display ad ideas, we only ask one thing of you. When looking to other brands for inspiration, make sure that the concepts you “steal” are translated into your ad designs in a way that speaks to the true uniqueness of your brand. Be true to your brand. Learn the difference between what it is to Steal, Copy & Imitate — and stand out authentically without trying too hard.